Ryley missed several days of school due to a nasty cold that left him with an ear infection. He had mounds of make-up work to finish. The timing couldn’t have been worse, as it’s the end of the school year with projects and finals lurking near. I asked him to compile lists of what he needed to do and keep us in the loop. His US History class seemed to have the most going on. When he announced he was going to need my help with a small project, I sighed. I knew they were learning about the late 20th century and he probably needed a reliable source. How handy to have a mom born in 1971! “What do you need?” I asked. Artifact? Let me think about that word. Artifact. The Bayeux Tapestry is an artifact. The Book of Kells is an artifact. There were two things wrong with his request. First, items retained from the 1970s can’t be referred to as artifacts yet. It hasn’t been long enough! Right!? Second, what if it has been long enough? That means I am old. I was so confused. “Yes, an artifact! It’s like a show and tell. I have to share it and talk about why it was important to people in the 1970s.” Ah, yes. We were a simple folk, dazzled by shiny mirrored balls. We ate La Choy Chop Suey from a can in front of a TV wheezing out The Fonz. Bless our hearts. I wandered aimlessly through our house, mentally curating items and coming up short on things from the 70s. Within these walls, there is a distinct lack of macrame plant hangers, owl portraits done in string wound around nails, shaggy things, avocado green small appliances, waterbeds, and Gee Your Hair Smells Terrific Shampoo. I had nothing to offer. 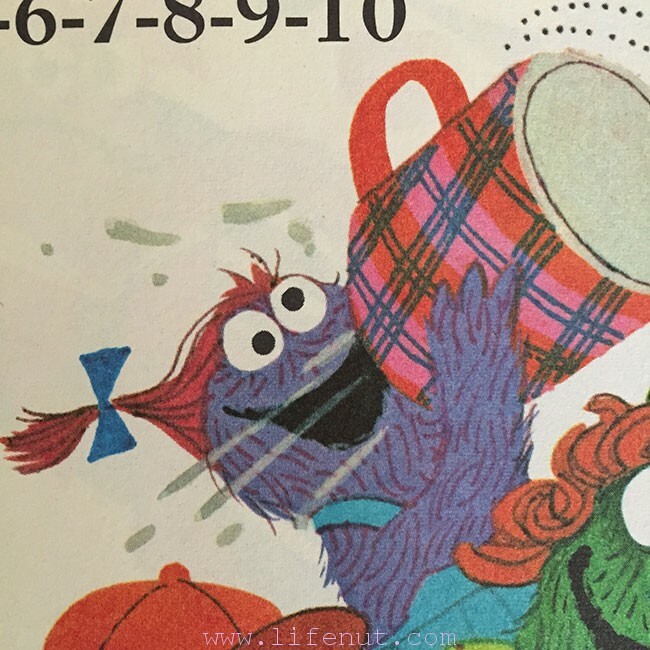 Then, I remembered my collection of Sesame Street books. 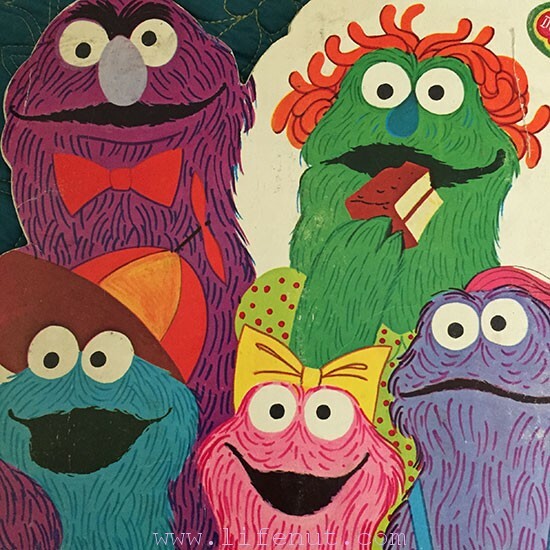 Resting behind glass, safe from the grape-jellied paws of certain people, lounges a small, lonely stack of Little Golden Books featuring the best and brightest of the Sesame Street gang, pre-Elmo. Many were published in the early-70s and in decent condition. I found several at Goodwill and other thrift stores, snapping them up without hesitation. Rather than give them to my children, I squirreled them away in my room to keep them as nice as possible. The National Archives Rotunda has the Declaration of Independence. My Target nightstand has “Bert’s Hall of Great Inventions.” It would be a shame if some Cheeto-powdered tourist from, say, Colorado decided to hug the Declaration of Independence. Same with my books. I presented several book options to Ryley, explaining why I loved them back in the olden days. I told him how I identified more with the monster family in “People in My Family” because they had a mom, a dad, two girls, and one boy — just like my family! I pointed out Pop Pop, Row Row, Aunt Alison, and Uncle Brian to him. I like my coffee like I like my googly eyes: black and full of life. The next morning, he settled on taking the book about Bert’s inventions. He had no idea what he was going to say about it, so I told him back in the 70s there were only a few TV channels and if kids wanted to watch fun shows on weekdays, PBS was it. But slung together with Mr. Roger’s Neighborhood and The Electric Company, it was enough. I never dreamed of needing another source for Alphabet Dancers. Ryley returned the artifact after school. I returned it to my safe little hiding spot where it will sit in the dark waiting to be remembered by a woman who can’t forget.